The villages are long and narrow. 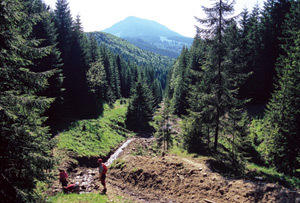 Situated east of the Vişeu River in the northeastern part of Maramureş County, the Maramureş Mountains are part of the Carpathian Mountains, and are formed of only one main range that runs from northwest to southeast. 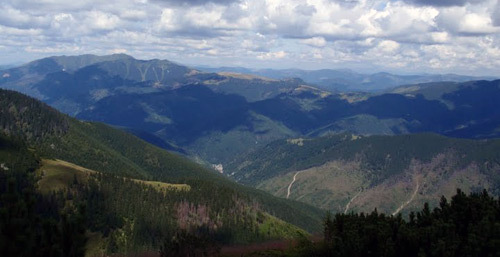 They form a natural barrier between Maramureş and Bucovina to the east, and extend far into the Ukraine. They are over 100 km long with a total surface of about 1,500 sq. km. The highest point is Farcău Peak (1,957 m). There is a multitude of small rivers and brooks. Two rivers, Vaser and Ruscova, divide the range into three main parts. These rivers form two of the most impressive valleys of the region, with spectacular steep slopes. Vaser, the most important tributary of Vişeu, is about 60 km long (see Mocaniţa p. …). 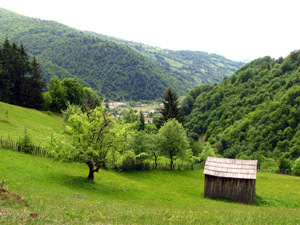 The valley is considered to be one of the most beautiful ones in the Oriental Carpathians, offering a succession of wonderful and unique landscapes. Two glacial lakes can be found here: Lake Vinderel, the biggest glacial lake of the Eastern Carpathians, situated at a height of 1,684 m, and Lake Băiţa. Several species of plants unique for the region have survived in its immediate surroundings. 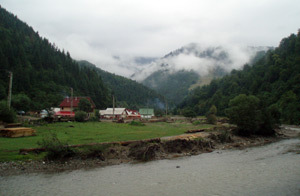 The Vişeu River is one of the two main rivers that cross the Maramureş Depression from southeast to northwest. 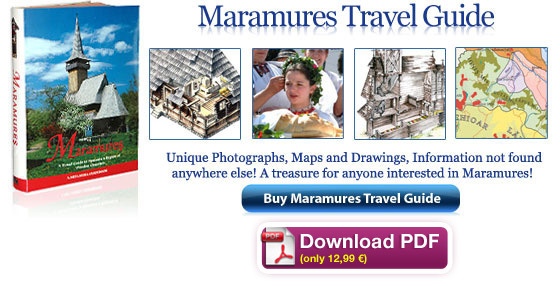 To the east of it are the Maramureş Mountains that are rugged and difficult to access, while to the west are the gentle lush valleys with the more famous villages with their wooden churches. 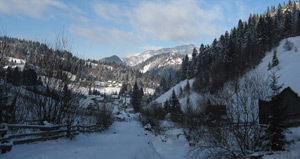 Ruscova is the first village after leaving the national road DN 18 in the Vişeu River valley and heading up the Ruscova River valley on the county road DJ 187. It is about 50 km from Sighetu Marmaţiei and 30 km from Vişeu de Sus. Together with nearby Repedea and Poienile de sub Munte, Ruscova is one of the biggest communities of Ukrainian (or Rusyn) Hutsuls in Maramureş: of the roughly 4,700 inhabitants, more than 4,500 are Rusyn. 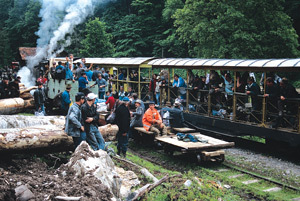 The famous Mocanita Train on the Vaser River Valley – Maramures Mountains. On the left bank of the Vişeu lies the village of Petrova. It is 36 km from Sighetu Marmaţiei and 24 km from Vişeu de Sus, easily reached either by car taking the DN 18 or by train, as there is a railway station in the village. Although there are archaeological finds from the Bronze Age, the first written record is from 1411. As most of the villages in Maramureş, also Petrova used to have a wooden church. It was built in 1670 and destroyed in a fire in 1856. Two decades later the stone church of Susani was built, and in more recent years the construction of a new Josani church has been started. 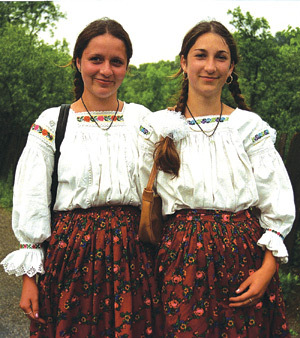 Mostly Ukrainians or Rusyns live in the villages of the Ruscova. 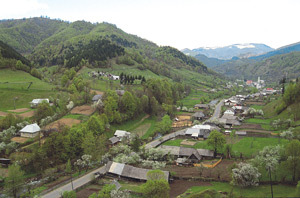 Leordina with its 3,000 inhabitants is just 5 km further up the valley of the Vişeu from Petrova, on the DN 18. There is also a railway station here, the closest to the villages in the Ruscova River valley. The name of the village comes from the word leurdă, meaning ramson or bear’s garlic. 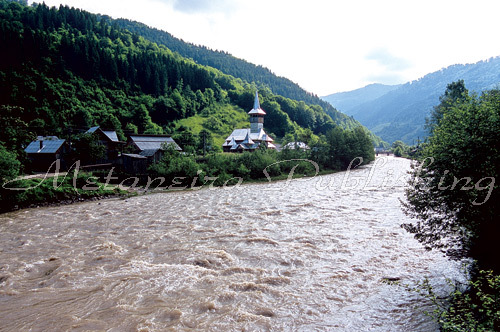 Repedea is the next village up the Ruscova River valley, 11 km from Ruscova, at the confluence of Ruscova and Repedea Rivers. Repedea was founded by Ivan Krevan in 1350, and its name in Ukrainian until this day is Krevei. 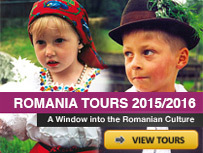 Most of its more than 4,800 inhabitants are Rusyn, whose main occupation is sheep and cattle breeding and agriculture. Poienile de sub Munte is an attractive village, the last one in the Ruscova Valley, some km further up from Repedea. Beyond it there are just the Maramureş Mountains and fantastic landscapes: green hills crossed by small rapid rivers and meadows covered with multi-coloured flowers. Poienile de sub Munte is the biggest Rusyn settlement in Romania, and thus a lively centre of specific customs and traditions. Vişeu de Sus is a small town situated in the heart of the historic Land of Maramureş, 65 km from Sighetu Marmaţiei on DN 18. The first document that mentions the existence of the town dates back to 1365. Vişeu de Sus used to be called “Între Râuri” (Between the Rivers), because it is situated at the confluence of the Vişeu and Vaser Rivers. The population, scattered on this large territory, is concentrated in the centre of the town and in the nearby river valleys, which before 1956 were separate villages: Valea Vaserului, Valea Vinului (Wine Valley), Valea Peştilor (Fish Valley), Valea Scradei, and Valea Botoaia. The town’s fame is mainly due to the train station, wherefrom each morning the old steam train called Mocăniţa goes up the Vaser Valley, and returns late in the afternoon. ami place forte multa parinti mei statiau acolo si ami povestiau multe lucruri . Foarte frumos, ma bucur ca macar asa pot sa vad si eu Maramuresul de aproape. Sunt plecata de 10 ani din tara si nu prea am vazut mare lucru ca eram prea mica. Multumesc celor care s-au gindit la noi care am plecat din Romania.